Arthur Kentish came from the United Kingdom as an 11-year-old boy from the Bernardo home. He lived with Archie and Sarah Martin at W 1/2 Lot 25 Con 8. 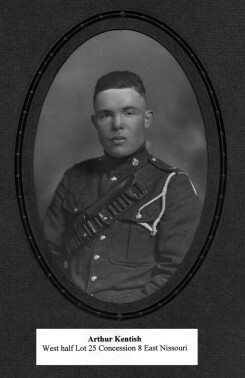 He joined the Perth Regiment and fought overseas. After the war, he went to work for Irwin Gleason and later fought in WW 11.